The Supreme Court returns from its summer recess with cases for argument today about the dusky gopher frog and age discrimination in government agencies with fewer than 20 employees. As Adam Liptak observes in The New York Times, the court’s docket presents “lower-profile but still consequential legal questions” that may allow the justices “to find ways to bridge the usual ideological divides” amid the continuing battle over the nomination of Judge Brett Kavanaugh to the court. The courtroom is quite full this morning. Ginni Thomas, the wife of Justice Clarence Thomas, has taken her seat in the guest box. In the spectators’ seats is Anna Salvatore, the New Jersey high school junior who founded High School SCOTUS, which started as a blog about Supreme Court cases affecting students but has morphed into a more general blog about the court. Today, Salvatore and five other contributors to the blog have secured seats for the day’s arguments. 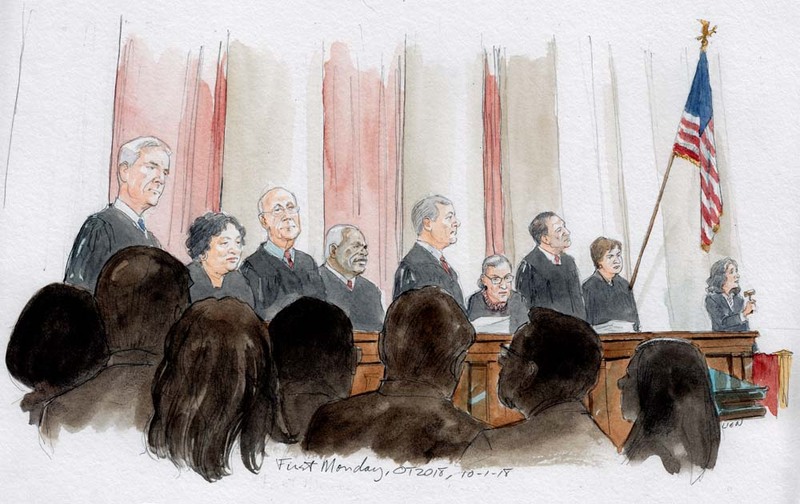 The justices take the bench at their new rotation, reflecting the retirement of Justice Anthony Kennedy. Thomas is now the senior associate justice, and he moves to the right of Chief Justice John Roberts. Justice Ruth Bader Ginsburg is now at the chief justice’s immediate left. Every other justice rotates up one notch. Justice Neil Gorsuch, now on the far left of the bench (looking from the audience) smiles and heartily says hello to Clerk of the Court Scott Harris. With the vacancy still open for Kennedy’s seat, there is no chair at the ninth position on the bench. Some pending hot-button cert petitions had already been pulled from the lists for consideration at last week’s “long conference,” which deals with matters that have piled up over the summer recess. Others are simply not acted upon today. And many hundreds are denied. The chief justice has one more preliminary matter this morning. The chief justice then calls the first case, Weyerhaeuser Company v. U.S. Fish and Wildlife Service, about the dusky gopher frog. That argument is marked by Justice Stephen Breyer’s repeated references to need to “drain the swamp” to preserve the endangered species’ habitat. After Breyer’s third or fourth reference to “drain the swamp,” for which he is not acknowledging any other recent use in a different context, Justice Samuel Alito cannot contain a smile. The second case today, Mount Lemmon Fire District v. Guido, about whether the Age Discrimination in Employment Act covers government subdivisions with fewer than 20 employees, is fairly straightforward, with the exception of the fact that the lawyer arguing for the fire district, E. Joshua Rosenkranz, who has argued at least 17 times before the Supreme Court, is identified in the court’s “day call,” or listing of the day’s lawyers, as “E. Joshua Rosenberg.” The online version of the document is corrected by the time court is over just after noon. 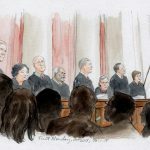 As the arguments proceed, we set to thinking about whether the chief justice has parted with any protocol by not recognizing Kennedy, who announced his retirement on June 27, just hours after the justices had issued their last merits opinions of the term, and whose retirement took effect on July 31. It has been some time since a retiring justice announced his or her departure after the end of a term. Several recent retirees had announced or let leak their intention to retire in the early spring, and their departures were recognized at the end of that term. These include Justices John Paul Stevens in 2010, David Souter in 2009, Harry Blackmun in 1994 and Byron White in 1993. Justice Sandra Day O’Connor announced her intention to retire in July 2005, after the end of October Term 2004. But the death of Chief Justice William Rehnquist that September led to a scramble, with Roberts’ nomination for O’Connor’s seat withdrawn and submitted instead for the chief justice’s seat. O’Connor agreed to stay on until her successor — Alito — was confirmed in late January 2006. Rehnquist then read a short letter sent to Marshall by his colleagues, as well as Marshall’s reply. On that day, Thomas’ confirmation battle was still being waged. So, like today, just eight justices took the bench to open the new term. The post A “view” from the courtroom: Opening with an empty spot on the bench appeared first on SCOTUSblog.